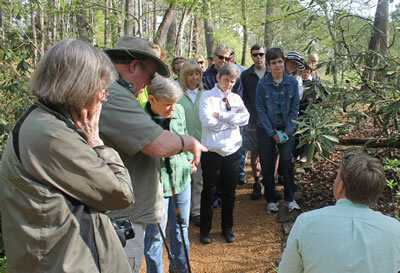 The South Carolina Native Plant Society (SCNPS), in partnership with the South Carolina Botanical Garden (SCBG), is excited to announce a Certificate in Native Plant Studies. Based on South Carolina’s rich botanical heritage, and through hands-on field-based classes, students learn about native plants and their vast diversity, plant communities and the habitats that define South Carolina from the mountains to the sea. Participants also learn about the significant benefits of native plants in ensuring biodiversity, and improving soil, water and air quality, as well as discover the importance of sustainable and appropriate development, become aware of conservation issues facing native plants and plant communities, and become educated environmental stewards. In elective courses, students will also have the opportunity to visit and learn more about the various ecosystems in South Carolina. Classes are all taught by qualified professionals. The certificate program is composed of 88 hours of coursework (7 core classes @ $80 each plus 32 hours electives) (10% discount to SCNPS members* and Garden FRIENDS). Students are not required to pursue a Certificate in order to enroll. *If you are a current member of the South Carolina Native Plant Society, click here to get your discount code.